Nathan Shirley (b. 1981) is a composer who has written music in most genres: ballet, film scores, various orchestral works (including a piano concerto), chamber, vocal, and solo piano music. The list of compositions at his website (www.NathanShirley.org) suggests he has a large output for someone who, as I write this, is only thirty years old. If I can judge from this disc, I would say he is musically conservative, as mostly everything here is quite approachable for the listener. Shirley is mostly self-taught, though he studied for a time with Olga Harris, a student of Khachaturian. In the notes to the disc (apparently written by Shirley himself) he acknowledges a stylistic debt to J.S. Bach, Vivaldi, Schumann, Chopin, Stravinsky, and Prokofiev. I don't hear much of the voices of any Baroque composer in this music, and while there are snatches of Chopin and Schumann here and there, the greatest influences appear to be that of Prokofiev and the unmentioned Liszt. That said, Shirley is not an imitator: his style is eclectic, divulging somewhat Impressionistic tendencies (as in Images – a collection that, in spirit at least, recalls Prokofiev's Visions Fugitives), and exhibiting that Lisztian mixture of the angelic and demonic. Shirley also mentions his interest in folk music from various traditions across the globe, acknowledging its influence on his style as well. Images, as the reader will observe from the heading, are a collection inspired by Roman Catholic religious figures and events. Each is short, the whole set of ten lasting about seventeen minutes. There is a mystical but often agitated character evident in these colorful, well imagined pieces. The Seven Modes are shorter, lighter, and quite folk-like in character. The moods are colorful and often quite exotic. The pieces comprising States of Mind and The Black Cat Suite divulge the darker side of Shirley, but there are many moments of sunlight, especially in Contentment and Dreaming, from States of Mind. Perhaps the single most interesting piece here is the Toccata. Shirley begins with a deliberate nod to Prokofiev, the opening notes being a virtual quotation from the first bars of Prokofiev's famous Toccata. But then the work goes off in a different direction, and if any composer comes to mind later on, it's Liszt. But Shirley manages to be quite original for the most part: the work comes across with a dark character wherein a pursuit appears to be taking place: are evil forces breathlessly chasing down their prey? 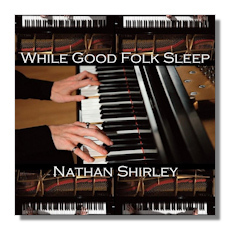 The title work, While Good Folk Sleep, is a collection of four pieces that are also dark in mood. Again, they are short works of quality, but why the disc takes its title from these and not from the better and more substantive Images I cannot say. The CD closes with The Beast, another dark work. This one is quite light, however, and features jazzy rhythms and a sort of ragtime character in an episode midway through. The music here is quite catchy and conveys a half-serious but quite dramatic manner about its subject matter. I've skipped several of the pieces and they are mostly of good quality. The finer works here, as suggested above, are Images and the Toccata. I've mentioned Impressionism in Shirley's style, but when it's there, it's generally not the Impressionism that evokes images, but rather moods and thoughts. He captures the moods in Edgar Allan Poe's The Black Cat quite effectively and in Images he has a most unorthodox, but effective way of conveying religious character and events. Shirley's performances are beyond cavil, as his technique, interpretive skills and sense for color are exceptional. If he were only a pianist, I would guess he could have a major career on the concert stage. The sound reproduction on the disc is excellent. This CD can certainly be recommended to keyboard enthusiasts who want to sample a new and possibly important voice among modern composers.